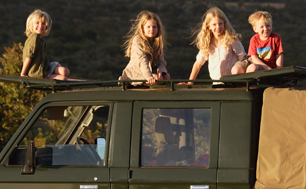 A family holiday to Africa offers a wonderful bonding experience, as you discover new adventures together, fun for both parents and children. Africa has a lot to offer families, but it's important to visit places that actively welcome children, rather than simply accept them. For interested children, who are old enough to understand what they see, Africa can be an amazing and inspiring place. 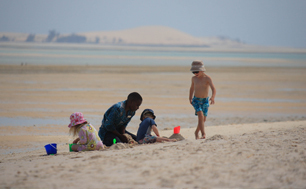 There are great beach destinations such as Mauritius or classic family safari experiences in South Africa, Botswana, Tanzania and Kenya - you can even mix it up in an unbeatable Big 5 safari and beach holiday combination. Virtually no time difference - start enjoying your holiday from the moment you arrive. 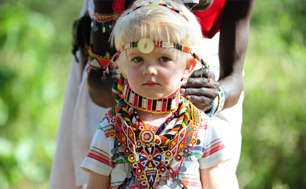 Brilliant with kids - what could be more exciting than having a Masai warrior as your guide! Many places have special offers for kids, making family travel more affordable. Take a private safari or beach house - perfect filled with 2 or 3 families.